Epson EcoTank M2140 Multifunction Inktank Printer, Small business print scan copy USB Mono only, 39ppm Mono A4 Business Inkjet/Multi-fuction/Ink tank system/Mono, Letter Legal, Print, Scan, Copy, Duplex, 251 Sheets maximum, 1.200 dpi x 2.400 dpi (Horizontal x Vertical), LCD screen: Diagonal: 3,7 cm Copyright © 2019 ComXpert International CC - COPYING IS ONLY ALLOWED FOR THE PURPOSE OF SENDING US ENQUIRIES. E&OE. A new mono EcoTank printer for business, with an extremely low TCO in a user-friendly, stylish and compact design. Print up to an amazing 11,000 pages with the included ink that comes in two bottles for mess-free, easy refills. USB connectivity, a 20ppm print speed and duplex printing all help to keep productivity high. A high ink yield with inkjet's low power consumption delivers a low TCO and a competitive cost per page. Benefit from a 600dpi print resolution, a high scan resolution and double-sided printing. USB connectivity and a compact footprint mean that its easy to place on a desktop and connect to a user's PC or laptop. Additionally, its high ink yields help deliver higher productivity. This reliable cartridge-free printer features an enhanced ink filling system and easy to use ink bottles, keeping intervention to minimum. Thanks to the ink tank being positioned at the front of the printer with a clear view of the ink levels, this new design is compact and provides easy access for refilling. Its fast First Page Out Time (FPOT) from sleep and 20ppm print speed mean you won't be waiting around for jobs. Inkjet technology helps keep energy levels low, without the need for any heat, unlike a laser, and of course, less energy use helps keep your energy bills low. 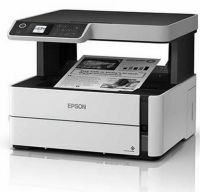 The best price and guaranteed service and backup from official computer suppliers in South Africa for the M2140 Printer Epson EcoTank M2140 Multifunction Inktank Printer. The Epson M2140 Printer Epson EcoTank M2140 Multifunction Inktank Printer is available for R6020. The product is sold by ComX Computers as new. Prices are valid today 2019-04-22 (before 2019-04-23 , by quote, while stocks last). The product is expected to be in stock, although this is not guaranteed. Find related M2140 Printer Epson EcoTank M2140 Multifunction Inktank Printer products in our Printers - InkJet 4 colour Category for even more options. Read reviews and find out about M2140 Printer Epson EcoTank M2140 Multifunction Inktank Printer. Discounts, specials and cheap prices only at ComX Computers.